A unique collection of over 50,000 jewellery pieces crafted in gold, diamonds and precious gems handpicked from over 20 countries. Showcases vast collection of jewellery from wedding wear to daily wear crafted in gold, diamonds & precious gems. 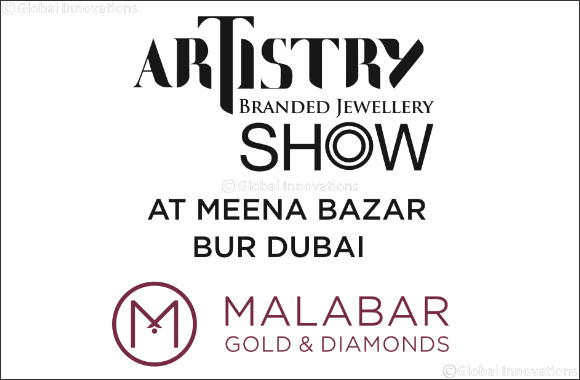 Dubai, UAE, November 29, 2018: Malabar Gold & Diamonds, one among the large jewellery retailers globally with a strong retail network of 250 retail outlets spread across ten countries has launched an exclusive jewellery exhibition named ‘Artistry – Branded Jewellery Show’ from 29th Nov to 8th Dec at their outlet at Meena Bazar, Bur Dubai, Dubai, which is the largest jewellery store in Bur Dubai. ‘Artistry’ - the branded jewellery show, provides the customers a great opportunity to witness the rarest and finest collection of handpicked designs from over 20 countries, offering the jewellery lovers a different kind of experience, a visual treat for the connoisseurs of fine art. The show takes exquisite jewellery to the next level by showcasing breathtaking creations from all over the world and from the master craftsmen of Malabar Gold & Diamonds. Customers can design their dream wedding jewellery by our experts for free in this show. We offer a fully bespoke jewellery solution to cater the all wedding jewellery requirements. The jewellery that makes any girl dream of her momentous day is what we present to you. Aristry – Branded Jewellery show showcases a fascinating range of Jewelry under their brands Mine, Era, Precia, Ethnix, Divine, Ago Bay & Solitaire One. Each item is a work of art, beﬁtting the elegant perception of a connoisseur - adornments that accentuate grace, in tune with the aesthetic sense and attitude of today’s woman. Customers will be able to witness vast variety of products in diamonds with a gross of 10,000 carats having a total value of over AED 50 Million under one roof, which will leave every one mesmerized. The showroom also displays over 300 kilos of skillfully crafted gold jewellery in 24K, 22K and 18K, ranging from lightweight daily wear to bridal jewellery in traditional as well as contemporary designs. To add to the customer’s delight, The jewellery show offering best diamond exchange offer, an exclusive opportunity to exchange and buy new diamond jewellery by giving the highest value on your old diamond jewellery. This is truly an exclusive offer which no other jewellery retailer has provided to customers and we recommend all customers who want to exchange and upgrade their old diamond jewellery to make full use of this opportunity. You can also be assured of obtaining the highest value on your exchange as a part of the offer. Any diamond ornament can be exchanged with the classic, trendy and unique designs available at Malabar Gold & Diamonds.